Remember when our friend Mamita said we were “island shopping”? It’s true, that’s what we’re doing, hopping and shopping. Maybe we’ll find the perfect place, and maybe we won’t. Maybe we’ll end up in Detroit. Bazinga, maybe not! But we’ve now made it to our next stop in the Caribbean, and it’s been a bit crazy before and since! We said we’d be going an hour and a half away, but things changed (remember – tranquilo, amigos, go with the flow). 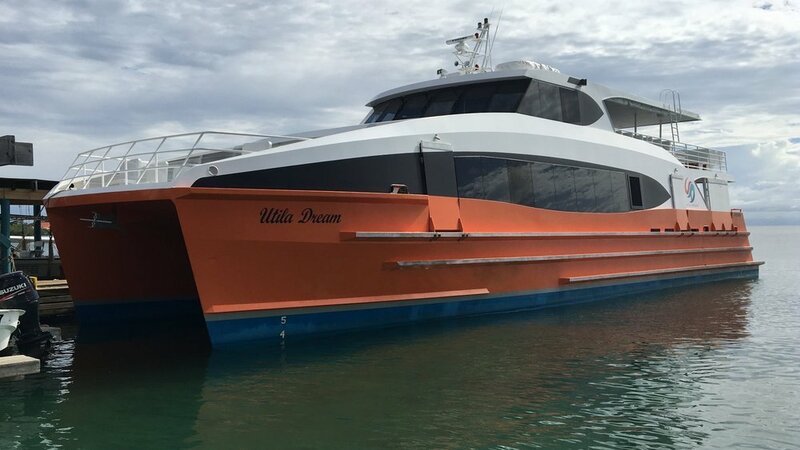 The original plan was a one hour boat ride on the Utila Dream Ferry (the cheapest option), an air-conditioned high speed catamaran cruiser. Because of political strife on the mainland (that got very ugly), the ferry system had altered their schedule from a 4X/wk schedule to daily, which allowed us to take it. This was to help islanders get around even while parts of the mainland were shut down. Then, as suddenly as the timetable changed to daily, it went back to 4X/wk and not on the day we needed to travel. Next thought: a smaller boat (with a larger price tag) that is used for charter trips around the island, to the mainland, between islands, etc. called the Lady Julia. So we set up that 1½ hour jaunt about a week out. Then a cold front came through with some very strong winds, steady rain, high seas, etc. The front was going to head on out before departure, but it made us realize that boats were not as reliable as planes even with just the normal rainy season weather that comes in. Boats have to deal with the weather the whole 1-1½ hours, and can’t dodge storms much at all. Planes OTOH, are only in the air a few minutes and can steer around squalls (we did a little bit of that on the way into Utila). At this point we were down to the last few days, we had no plan, and nobody around here thought that was weird at all. It was Sunday, we were leaving on Wednesday, but we didn’t know how we were doing that. Perfectly normal! So we decided it was going to be a plane (the most expensive option), but we were still hauling around those oversized duffels that we mistakenly purchased a year ago. That 4-seat Cessna we flew in to the island was so very tight that we didn’t want to repeat it. Because of that, we ended up on a 5-seat Piper (Cherokee maybe? – I really don’t know planes). Still a single-engine but with low-wings (vs. the high wings of the Cessna). We actually had room for our bags, dogs, everything, although we did have to sit facing the tail which makes for difficult photography. As soon as we booked it of course, the big ferry changed course and went back to a daily schedule! But we were booked at that point, no regrets! Maxwell calmed down after a while. So tranquilo! The next challenge came at 8 am when the tuk-tuk taxi came to get us. Two large rolling duffels, two medium duffels, two carry-on size backpacks, two dogs in carriers, two adult humans later, and we were off. We didn’t plan to start these adventures with those 2 extra medium duffels, but the size limitations on the big bags forced our hand. We had to buy them at the last minute when we discovered the Caribbean size limits for the large bags. Our new plan (plan – such a funny word!) is to dump them and downsize the XL rolling duffels to a L size, and pack them to bursting. We’ll see how that works out but if we can, we would then be able to move ourselves without help. Anyway, it was a tight squeeze but our driver Alejandro knew how to pack and shortly we were bouncing down the road with bags stacked everywhere. I’m holding onto bags to keep them from bouncing out & down the road, and also holding onto Maxwell the dog who is making a bit of a ruckus. He was pretty nervous during this period as he is during any transition, but he hung in there and the next thing you know we were at the airport. Safety Review Complete – let’s fly! Our plane was the only one there, and except for us, the entire population of the airport consisted of our pilot, a young Welsh woman assistant, the local lady who runs the airport cafe, and two young, bored Fuerza Naval soldiers (with obligatory automatic weapons) sitting off by themselves. We paid our US$2 exit fee each, loaded the plane, and boarded up. But not before the safety briefing, a first for us in any Caribbean small plane flight! Don’t hang on the doors, don’t talk on the headsets during take-off and landing, you sit here, you sit there, wear your seatbelts. 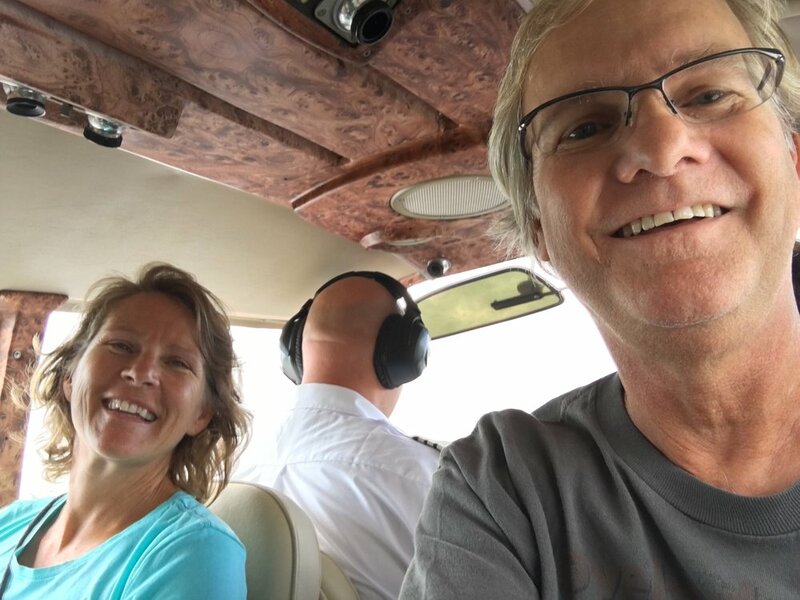 Our captain was a solid and capable man – I appreciated his professionalism and focus on safety (Island Air – highly recommended if you come to this part of the world). We took off with one other passenger to share the cost, plus one empty seat. It was much less drama in this more powerful plane – no worrying about the tall brush at the end of the runway! It was a cloudy day so we didn’t get those Chamber of Commerce reef pictures like the last flight, but in 15 or 20 minutes we were doing a 180, and coming down to the runway right over the top of a huge cruise ship. 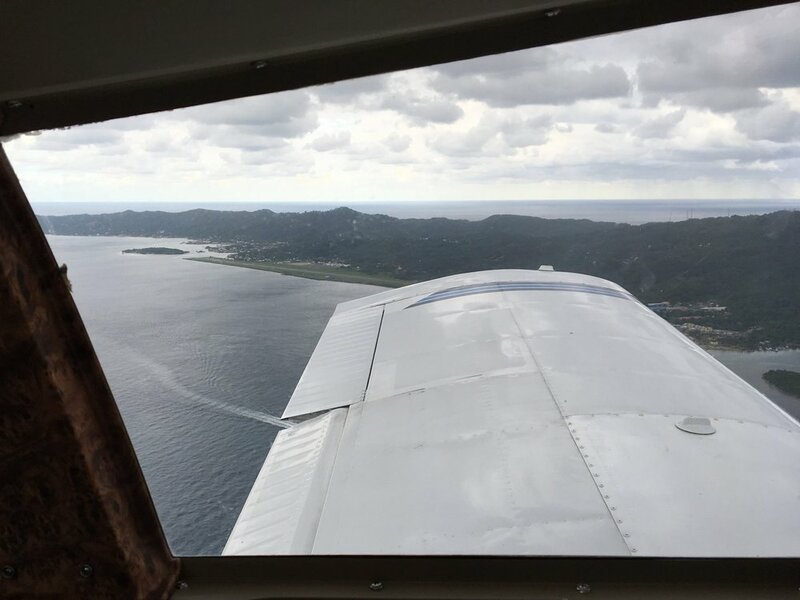 We were landing in Roatan, the Big Island! Yes I know, it’s a boring change, right? Same country, same “Bay Islands of Honduras” label, just one island over. But it’s a different place, very different considering how close it is to Utila, as we’ll all see. And it has been on the island shopping list for some time now. The same country and language give us some familiarity, but with some upgrades, some significant differences, and not just because it is so much bigger (48 miles long vs. 8). I actually fear we won’t be able to fully explore this rock because it’s so big, but we’ll take a pass on the kid-focused attractions that are common here – that should help. We’re still going to go at our own pace, and if we run out of time before we run out of island, then we’ll just have to see about coming back again, won’t we? 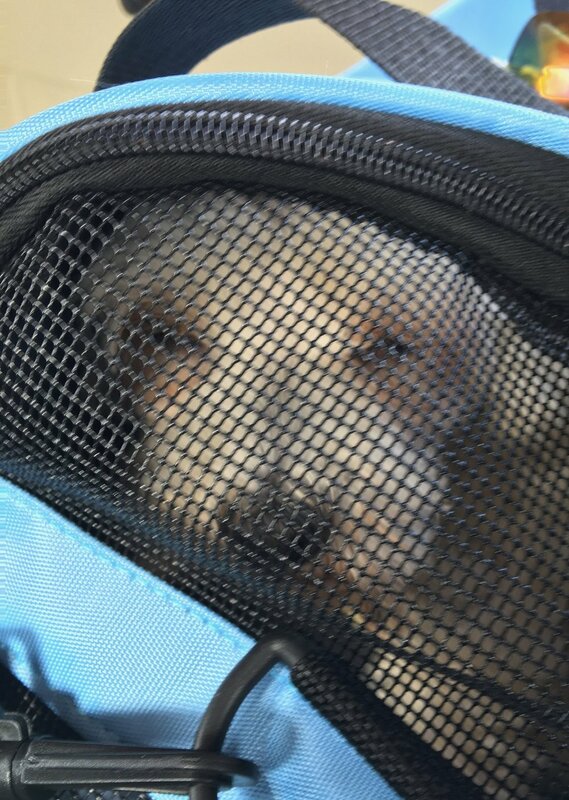 There was nobody on the tarmac to haul our bags so we each took a backpack, a dog in a carrier, and a rolling duffel, and the captain took our two medium sized duffels. We hit the small but busy island airport, dropped our bags and looked for our taxi driver. He was set up by the condo management company for us, but he was also nowhere in sight. We did get help from a nice Spanish-speaking man who was preparing to load us into a taxi, any taxi. So Deb had to whip out her growing Spanish skillset to keep him from helping too much! He set us up out on the curb to wait for our driver, putting our stuff on a rolling cart in case of “lluvia” (rain). Within 5 minutes it was raining, so we pulled our stuff inside and called the management company. They hadn’t received our message that morning about leaving Utila but they were on it now. About 15 minutes later there he was, a friendly driver who took care of our every need, including a stop at a grocery store on the way to the other side of the island. The airport is in Coxen Hole (don’t think about the name!) and we were staying in West End, a sleepier part of the island on the (you guessed it) west end of the island. So it was groceries first, at a full featured USA style grocery store called Eldon’s, a very impressive place for an island. It was only slightly smaller than the huge grocery stores I’m used to in the states, with pretty much everything. I saw competing brands of many different products, something that’s not as common as many North Americans might think. Then we were off to check in at the management company, and finally over to our place. The drive took us down a cute little street right along the water, with colorful restaurants, mini-marts, bars, and dive shops. The road was narrow and like Utila, it had no sidewalks, but it was quieter and less busy in general. And the road was right along a sandy beach with crystal clear water, so the views were excellent. At first blink, it was very positive, this place looked really nice! We turned up the hill and drove past a red and white metal gate that is raised by a nice guy in a guard shack with a hand crank! Then past some nice buildings, all part of the complex where we were staying. We went up the hill further and things changed. The buildings were more rundown, with obviously less maintenance being done, black mold running down the walls, and then we saw our 3-story building. It’s at the top of the hill on a dead end street so it’s very quiet, a nice bonus. But the building is worn, in need of paint, cracked concrete, mold, and with a strange structure on the front of the building, on the 3rd floor balcony area. Upon closer inspection I realized that somebody had mounted a locked metal security gate to the wall, to prevent people from gaining access to their section of the balcony. Then, they added a roll of razor wire and a jury-rigged set of spikes made out of rebar mesh, to make it harder to climb around! This thing is not only a monstrosity, but it gives the impression that crime is rampant here. First impression of the building = bad! Our unit OTOH was/is on the back side away from that silliness, with views of some houses and many trees, looking west toward the sunset (the trees in the distance have grown up too high to actually see the water). It’s a nice 2 BR apartment, pretty modern (granite counters instead of plywood! ), definitely a step up from our previous apartment. We have a water dispenser for the blue purified water jugs; we didn’t have that before. We have a microwave, a blender, a working toaster, and hot water in the sinks! They just replaced some cracked floor tiles and freshened the paint in the place. It looked very nice and it had comfortable couches, something I’d been longing for after the hard futon in the last one. But we quickly started noticing things that were in the advertisement, or I should say we didn’t notice them. Like a washer/dryer, Internet, and a TV that worked. We haven’t watched television since September so we thought that might be nice to have. But these things, clearly in the ad, were either not there or did not work. There were a couple of other maintenance items as well so the next day I crafted an email with a long list of gripes, and boom! They jumped all over it – we had 5 different people in our place in the next 24 hours, checking off everything they could (and they all had a copy of my email, ha!). Gaining that water view would require a backhoe on somebody else’s property a half mile away, but everything else is solved. Props to the management company for their impressive response, but a ding to the owner/manager communication path as they didn’t seem to know what it was they were offering. We’re not picky travelers but when something is promised, and we’re paying good money for it, we expect to receive it. 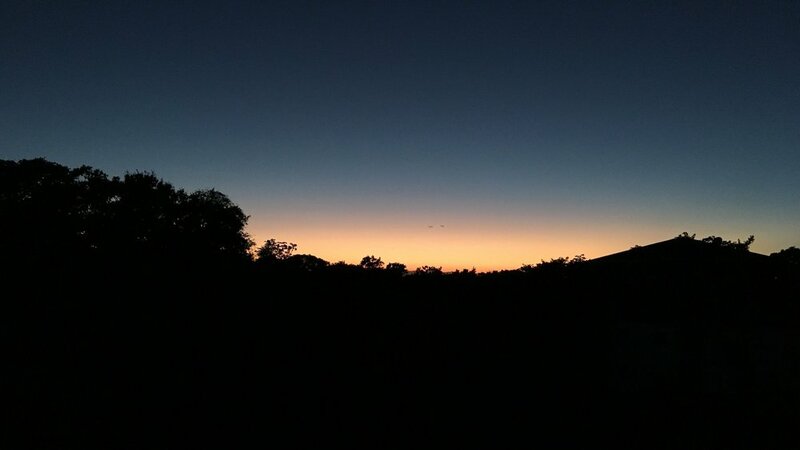 Complaints about the sunsets? None! Bottom line, we are settled into a nice unit in a strange building that is a 10 minute walk down the hill to the beach. Deb has since met the top floor (razor wire) people, and they are very nice young professional men, one who wears scrubs. Maybe we’ll get a chance to ask them why they have that eyesore on their balcony, but they now have it decorated with Xmas lights! The short beach walk is easy, quiet, and oh so peaceful. It’s a nice change from all the chaos of tuk-tuks, motorcycles, scooters, 4-wheelers, and horns on the tiny streets of Utila. The main street along the water is busy, but not to the same level as Utila, and much quieter. We had read that Utila had almost no automobiles, and that was an attraction to us. On the ground, we found out they have plenty of pitchy, loud, small-engine vehicles that are not very pleasant, and all those horns! 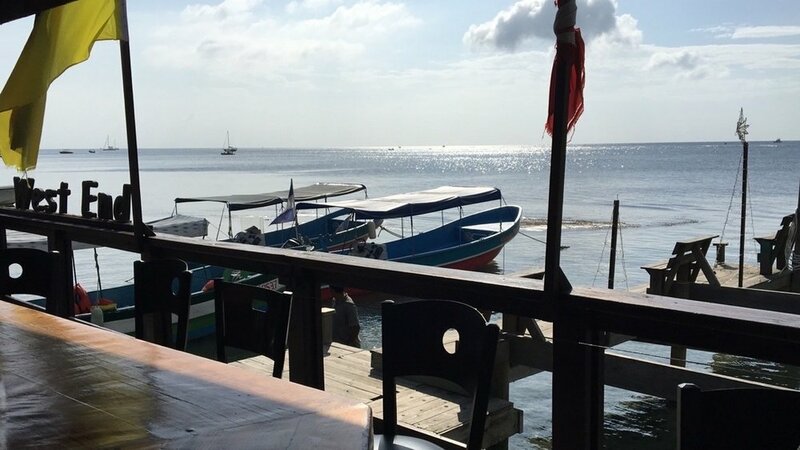 In Roatán, the taxis and cars are automobiles and there are trucks and buses, too. But they have quiet engines with real mufflers, and we’ve really come to appreciate that. Coming back up here, the hill is steep enough that tourists complain about it online, quite a bit. We just enjoy the mini-workout and hoof it on up. There will be lots more to say about this island in the coming weeks. We spent Thanksgiving & Deb’s birthday in Utila, and now we’re having our Wedding Anniversary & the Holidays here in Roatan. We’re really looking forward to an island Christmas! But before that, we’ve got to plan for (there’s that word again) some Central American politics / immigration “issues”. Don’t worry, all will be revealed, and there’s plenty more to talk about on The Big Island called Roatán! TODAY’S SPECIAL: “Upside Down” by Jack Johnson – we’re finding the things they say just can’t be found. I suspect the insinuation of a bad review on your blog post, made most of the difference in property management company’s prompt response! Glad it got resolved! Actually, they have no idea about our blog, but everyone these days in the hospitality industry is worried about online reviews – TripAdvisor, Bookings.com, Travelocity, you name it. I’m sure that was a factor! As you may recall, we’ll be there in May. It is likely you will have island (s)hopped again by then, but if not it would be so cool to visit with you tranquilo amigos! Unless something changes (and that’s always a possibility) we will have to move on before then. Would love to hang with you cool Colorado people so let’s stay in touch! "At this point we were down to the last few days, we had no plan, and nobody around here thought that was weird at all." 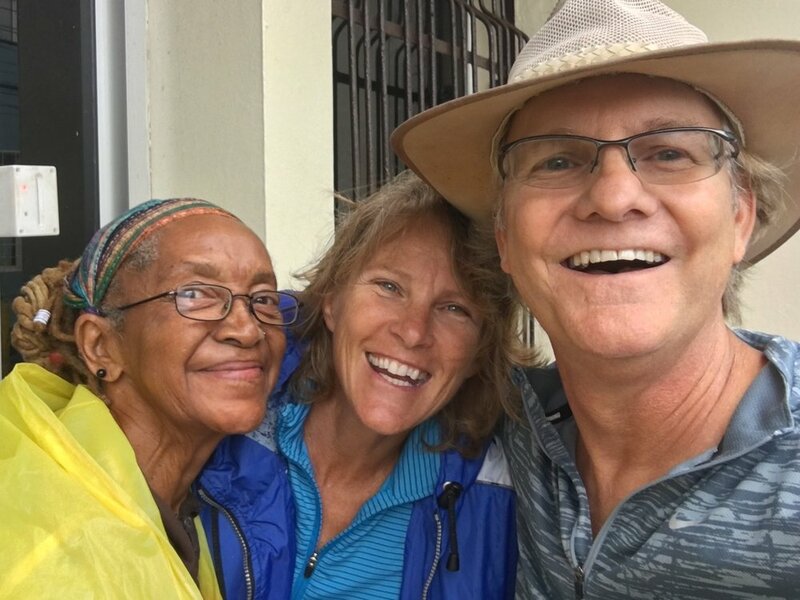 You blog post raise all kinds of questions -1) The Naval guys at the airport – didn’t recognize you from your earlier stroll down the runway?2) Earlier, you had mentioned that you may have to spend some time outside Honduras, due to VISA reasons. Then you hop 20 miles to …. Honduras! What did the Naval Guys (with automatic weapons) at Roatan think?3) Back in the ‘States, we have this crazy web-based thingy called Google Map. I see the Airport and West End. About 2.5 miles through the jungle, or 5 miles by twisty-turny road. Where do you buy groceries? (I have a Safeway about 5 blocks away; I use the car because groceries are heavy and gas is cheap. )4) There are no five-seat aircraft. Well, not that I know of. Maybe four seats and a baggage area? (This will teach you to notice all those numbers on the nose of the aircraft.) For us Cessna 182 drivers, Piper implemented the wings on the wrong side of the aircraft, so the supplied photographs don’t help much. Thanks for the comments! The Naval guys apparently didn’t see me on the runway that day, it’s a long runway! Also, they are bored but usually not so bored as to be looking down the runway all day. As for groceries, search for “Grocery store near Roatan” in that fancy Google maps thing. The big stores are in Coxen Hole, and there are small local shops everywhere. But they might not show up from the satellite view. 5-seat aircraft – pretty sure this was a 6-seater with one removed. I do find it funny that the pilot counts as a seat. That’s where our baggage was sitting, in the conspicuous empty area that could have had a seat in it. I’ll try to take more aircraft pix in the future! Of course the pilot counts as a seat! Do you expect him to fly the plane while standing on the landing gear? Or do you expect to sit on his lap? I can see that you need an intro flight – stat – when you get back to Ft Fun. First, while standing on the strut, then while in the left seat. Thanks for the answers. Enquiring minds are satisfied. Well, except for the Visa thing. On the edge of my seat reading this.. AWESOME! Just moved your RSS feed to the top of my list :-).. Damn glad you found the Next New Island. You know, there is a lot to learn for all of us in terms of flexibility and planing and then reacting. Good lessons from the Zen Masters Norm and Deb. You know.. you should check this blog stats.. I bet you have some VPs in the Hospitality Industry (and Condo Management too! 🙂 just waiting for your next installment.. Thanks again, Norm, for this blog! Thanks a lot Paul, that’s high praise from the Zen Yogi himself! 🙂 We’re really excited to find out about this place too! Update: it’s quartz! But yes, it’s twice the price for rent here vs. Utila. Part of that is the time of year.